Because I intend to hitchhike from Pie de la Cuesta 300 miles south to Puerto Escondido, my sanity immediately is questioned. A single lady hitchhiking on a Mexican highway! Crazy gringo! But I adore adventure. I also love to defy people. So I’m determined to prove that a single woman can hitchhike in Mexico and arrive safely at her destination. They wish me a good trip and drop me off at the crossroads. It is a fairly busy intersection with a bus depot on one corner. Many Mexicans are standing along the road apparently doing absolutely nothing. With my pack hugging my back I walk a bit hoping to get away from everyone’s stares. I hold out my thumb at the first passing car. It keeps going but at least everyone now knows my motives. Their suspicious stares turn to curious gazes. He looks safe, so I hop in. As we’re cruising down the road, the conversation reveals that this ordinary looking car actually is a taxi. Perhaps all the natives recognized it as a taxi, but I saw no such indication. Immediately I let him know I don’t intend to pay anyone to go anywhere. The driver knows about five English phrases. Fortunately, the one he uses on me is “for you … free.” He deposits me at another intersection so similar to the first one that for a second I believe he deceived me and cunningly took me nowhere at all. Again I stick out my thumb. A car stops abruptly. The driver is vague when I ask his destination. Besides, his eyes are shifty. I tell him “Andale, andale” (keep on going). Next my thumb stops a truck. Inside are two well dressed men. For some reason, their clothes convince me they’re alright. Also, they can take me 100 miles up the road. Salvador and Pedro make this trip once a week. They are supervisors at a construction site that will eventually be a factory. There is a pause. Salvador asks, “But do they eventually intend to get them?” I answer, “probably.” I feel uncomfortable sitting between them, knowing that despite their well paying jobs, even for them televisions and telephones are something of a luxury. Their turn off has come. We shake hands. The good-bys are sincere and friendly. I watch the truck drift down a dirt road and look around me. The highway is empty. There is a profound stillness in the solid green wall of tropical scenery. The sun is scorching. Yet neither the sun nor the lack of a ride really bother me. It is so utterly peaceful. I fee! privileged to be the only human in this panorama reserved for enticing postcards. I sit down and smoke a cigarette. About half an hour later, I hear a car or something coming my way. As it turns the bend, I make out a dilapidated truck with a spider web of cracks in the windshield, inside are three boisterous Mexicans. They stop – or at least they try to. But it takes a while, since the truck’s brakes aren’t too good. I explain to Isidrio, Bolivar and Napolean that the reason I am rejecting their ride has nothing to do with them personally. However, they seem just as offended that I have a low regard for their truck. Yet they give me a slice of watermelon then drive on as recklessly as they arrived. About 10 minutes later another car approaches and pulls to a halt. An elderly man says he’s headed for Puerto Escondido. Great! He’s a government engineer with the lavish name of Victor Santio Rocha Moreno. The Rocha is his father’s last name. The Moreno comes from the maternal side of the family. Most Mexicans have two last names for formal use, but for everyday use only the paternal last name is used. Victor’s driver, Onofre, has jet black hair that appears to be dripping with grease. He wears thick glasses whose lenses are mirrors, a long-sleeve white shirt that just barely covers a pot belly … a James Bond bad guy, if I’ve ever seen one. The car slows down just outside of Pinotepa. It is another one of those Federale road blocks. The young soldiers take down Victor’s name, destination and make of car. Routinely the Federales open trunks, checks glove compartments or dismantles suitcases, looking for people smuggling marijuana or running arms to the guerrillas. At Pinotera, we stop for a lunch of enchiladas and chicken soup. Victor gets a beer and, as is the custom, puts a little salt and lime on the edge of the can’s flip-top mouth. I get a Coke. When we enter the state of Oaxaca, Onofre bangs on the horn, honking in excitement at being back in his home state. After traveling a bit, I understood his passion for Oaxaca. It is a mountainous land with a rich green carpet of dense trees. We pass an enchanting waterfall. In the river below, a young peasant girl, naked from the waist up, is washing clothes on a rock. In the very distant mountains it is raining. We arrive at Puerto Escondido (Hidden Port) just as the sun is setting. I’m relieved to be here and happy with my successful traveling day. The typical traveler in Central America is either going up the Pan American Highway towards the States or headed down towards South America. Thus, everyone passes through the same line of countries. A look at the map shows that Belize — formerly British Honduras — is slightly off the circuit. So to be different, I ventured into that tiny country and into a minor case of culture shock. The vast differences between Belize and the other Latin countries are so incredibly striking that for several days I was in a constant state of amazement. I had no idea that Belize was predominantly populated by Negroes. Actually they’re referred to as Caribs. At first I felt like I was on the south side of Chicago. I arrived very late at night and contrary to sleepy Guatemala, the streets were filled with people cruising around despite the late hour. The blacks dress loud. They don’t just walk down the street, but tend to saunter with style. As I began to talk with people, Chicago vanished from my mind. These blacks speak an English dialect called Creole. Their accent is British and many words are unfamiliar. When they spoke pure Creole, I had no idea what they are saying. “Hey, mon” is how they greet each other with a smooth slap of the palm. My long skirt was referred to as a frock. A young man called to me, “Hey mama, stop your eyes” meaning he wanted me to come talk to him. Their place names are creative. I turned down a road called So Why? Street. I saw a clothing store called My Ting — in Creole, the “h” is abandoned in “th” words. All over Belize City one hears music. It’s loud and lively. And where there’s music, there are people freely moving to its beat. At Mom’s, a popular hang-out, an old black woman in a Salvation Army suit was shaking and shouting the gospel. A spirited crowd accompanied her words by clapping and chanting to her rhythm. Belize is a country with fewer residents than the city of Indianapolis. The people are extremely nationalistic and proud of their origins. I was fortunate to be in their country on their National Day. So I hitched a ride out to the “bush,” as the countryside is called, to partake in the festivities. The Belize children have to be the most uninhibited group of kids I’ve come across. They’ll be strolling along and suddenly break into a cartwheel or a series of aerial flips. One of the highlights of the Stann Creek festivities are the drums. The children perked up at the familiar noise. We moved en masse to where three black men were beating the instruments. The drums are tall, like congos. The beat is mesmerizing. Little boys of five or six started swaying to the vibrations. Every bone in their bodies was moving in perfect harmony to the rhythm. Their dancing to the drums is called the “punta” in Creole. The crowd was urging me to join in. Believe it or, not, I accepted their offer. The Caribs were overjoyed. These people adore anyone who freely lets loose with them. Compared to the young boys, I knew my “punta” attempts were pitiful. But it didn’t matter in the least. The main point was just having a good time. The drums, the punta, the swinging and swaying were to continue throughout the night. I dropped off early about 11 p.m. and went to sleep on the beach. At 5 a.m. I was awakened by the noise of people. The day was Nov. 19 and at this predawn hour everyone had come down to the Caribbean Sea. There were five dug-out canoes in the distant waters approaching the shore. The event was the reenactment of the Carib ancestors arriving at Belize from St. Vincent’s Island. About an hour later the canoes reached land to the cheers of the crowd. The entire procession then marched into town. The children performed again. Adults gave speeches. A queen was crowned. The next event consisted of a woman’s basketball game. The game was a little rough since the baskets had no backboards for rebounding and the court was gravel, but the spectators were as enthusiastic as Hoosier basketball fans. Because everyone was tired from staying up the previous night, the festivities closed early on Nov. 19 and people started going home by whatever means possible. I caught a ride in the back of a cement truck going to Belize City. The ride lasted about four and a half hours. The driver made several stops. At the first stop, he climbed out of the cab with a machete in his hand and cut a bunch of plantanos growing wild on a tree. Plantanos look like bananas except they are bigger, greener and harder. They are fried. Another stop was at a grapefruit grove. I stood on the cab and plucked several of die newly ripe fruit. As we passed over a bridge, the driver made a, third stop. It was so hot and humid in Belize that we took a fast dip in the deep creek below. A fourth stop was to let off another rider, a British soldier. There are 1,000 British soldiers in Belize. Britian granted Belize independence last year, but still maintains a military presence. This is because Guatemala doesn’t recognize Belize and wants to take over the country to gain a sea port on the Atlantic. Belize has no army so Britian supplies her defense. I mention the political point because it is so important to the Belizens. A tourist can’t avoid discussing the Guatemalan affair when speaking to the people. After attending the National Day festivities and being among the people, I’m convinced that Belize could never, ever be incorporated into Guatemala. The two countries are distinctly different. In Indian language, Titicaca means jaguar, and from the air Titicaca Lake on the border of Bolivia resembles a jaguar. Yet how did the ancient Indians, lacking aerial transportation or sizeable mountains to climb, conceive of this design? It’s another of the innumerable mysteries we have encountered in South America. Traveling nearly 20 hours overland from Cuzco, Peru, to Titicaca, the highest navigable body of water in the world, we stopped at a small village called Copacabana, situated on a peninsula that juts out into the lake. On sunny days the beauty of the area is stupendous. The crystal waters sparkle with a blinding blue effervescence, and miniature waves combine with an infinite horizon to create the impression that Lake Titicaca is a sea. Native dugout canoes drifted by as we lounge on the boulders along the shore. The Indian women, with their toothless grins, were amiable and frequently engaged in conversation with us. In our first chat with a native Indian we committed a faux pas: They prefer to be called campesinos (peasants) rather than indios (Indians), the latter being an offensive title to Bolivians. Thereafter we referred to them as campesinos. Because of the high altitude, the sun at Copacabana is extremely intense. Our thirsts were satisfied when we discovered a peasant women with a makeshift stand set up in front of the lakeshore. Her product instantly enticed us — fresh peach juice. Like the surprise packages in a Crackerjack box, much to our delight we found a genuine peeled peach at the bottom of the glass. Fresh Titicaca trout is Copacabana’s kitchen specialty. But surprisingly the price is high ($1.29) for a good filet with trimmings, because the supply has been drastically depleted over the years and the people have unwittingly failed to give the fish enough time to regenerate. From Copacabana we moved on to La Paz, distinguished as being the world’s highest capital. The seven hour bus ride to La Paz was unusual, since the bus was jammed with peasants transporting contraband from Peru into Bolivia to sell on the La Paz streets for a reasonable profit. At two check points along the route we were detained by “aduana” or custom agents. Naturally the smugglers didn’t want to be caught with an overabundance of outlawed goods, so we were asked to conceal in our backpacks such unlikely items as soap, underpants and tennis shoes. We willingly complied with their request, taking it more or less as a joke. 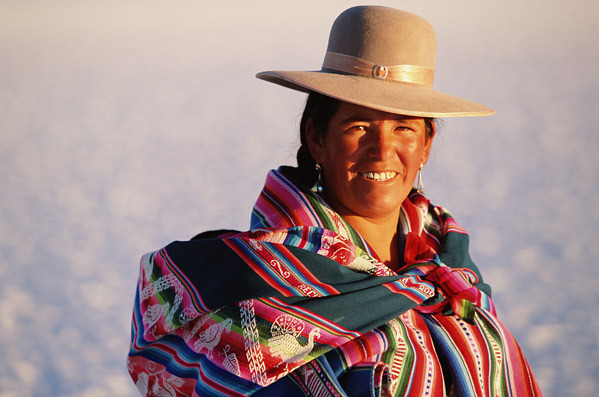 The Bolivian police ignored us, but a poor peasant woman fought viciously to retain an inconsequential product which would have earned her money in La Paz. From the bus window we watched the tragic drama unfold. First the agents removed her box from the bus to their jeep. At this point, she jumped on the moving vehicle and, clinging steadfastly, she desperately pleaded with them to give her a break. Tears streamed down her face and her baby dangled from her papoose while the agents mercilessly shoved her off the jeep into the mud. The entire affair was absurd when we learned her “crime” was transporting toilet paper. We arrived in La Paz during the midst of Carnival. Although Rio de Janeiro is the Mardi Gras capital of the world, every town in South America celebrates its own version of Carnival. Throwing water balloons is a characteristic of Carnival and the streets were hopping with high-spirited pranksters. No on escapes without getting wet, either from a balloon or from a bucket of water upended by a sniper on a rooftop. Two hours by bus from La Paz lies another one of South America’s mysteries — Tiahuanaco. This obscure archaeological site consists of only several intact ruins; nothing else has been reconstructed or restored. Chunks of rock are strewn througout the fenced-in area. We calculated that if put together like pieces of a puzzle archaeologists could surely provide some answer or hypotheses to the hundredsof unanswered questions concerning this place with no known recorded history. The rocks look natural just lying there on the ground, but we suspect they used to be part of some magnificent formation. The most impressive ecavation is the so-called subterranean room. It’s an extremely large perfectly symmetrical pit with walled stonework reminiscent of that at Machu Picchu. On all four sides of the quadrangle are sculpted heads representing various races from all over the world, including Oriental, Negroid and Caucasion features. Another spectacle which awed us was “La Puerta del Sol” or the Gate of the Sun. It’s a megalithic doorway carvedout of a 50-ton rock, complete with intridcate designs of birdmen engraved in the stone. Above the door’s entrance is a man crying because, as oral history has it, his people left for the stars. Tears spotting his cheeks are clearly visible. Visions of terror danced in my head whenever I used to try to imagine what Argentina was like after reading countless newspaper accounts of terrorist shootouts. But it’s a pity that the media seem only concerned with the political shakeups for Argentina has far more to offer. The country is fantastic due exclusively to the nature of the Argentine people. They aren’t friendly; they are overly friendly; They are cheerful, always smiling, helpful, noticeably sophisticated and enjoyable to talk to. Except for my experiences with the Greeks, Argentina has the finest nation of citizens I’ve ever met. If Argentina didn’t have a military government, I would find it ideal. However, the military is a reality. Within 100 miles of crossing the Bolivian border my brother and I were searched three times on a first-class southbound bus — one that served free refreshments. One passenger had the boldness to complain when soldiers ransacked his luggage. He had nothing of contraband, but because he protested, and mildly at that, the soldiers detained him. As the bus pulled away I caught a glimpse of the victim and was spooked to see such trepidation and terror in a grown man and such pompous wrath on the face of the uniformed officer. On two occasions, I witnessed the military’s drilling procedures, and they caused me to shudder, The 7 soldiers weren’t merely marching, but were goose-stepping, just like I’d seen in war documentaries of Nazi soldiers. After previous rides on other South American trains, the Argentine train was a relief. It was so clean you could actually sleep on the floor — which I did because it was a 36-hour ride to the capital. The train speeds down the tracks instead of ambling along. There’s no oversale of tickets, so that everyone has a seat, and crowds don’t block the aisles. Since everyone here was so decent, we had no worries about robbers. Tom had placed his hand-made Peruvian bag above us on the luggage rack. Suddenly it fell off the rack, ricocheted off my back and flew out the open window. We looked at each other in horror, knowing that inside the purse was his passport, all his travelers’ checks, health certificate, $15, all identification, plus an open plane ticket worth $75. The train made a stop about five kilometers later in a little village called Frias. We disembarked, backtracked up the rails for seven kilometers, but due to the summer’s high grass could find no sight of the precious bag. Disappointed, we returned to Frias to report the loss to the police, since, traveling around Argentina without any documents is worse than getting in a car wreck and not having a driver’s license. The people of Frias were tremendous. Lelia, a widow with four young children who works at the train station took us to the police to help explain the incredulous event to the officers. After a fatiguing amount of questions — also directed at me, who had lost nothing — Tom finally got a paper which served as a temporary passport. Lelia then insisted we spend the night at her house, where she fed us and mothered us tenderly. The next day we were going to leave, but about five men urged us to stay. These kind men took time off from their work to help us for a second day to scour the tracks. But, unfortunately the little Peruvian bag did not turn up. For a second night Lelia took us into her home and fed us well. I had showed her the various coins I’ve been collecting of each country I pass through, and she and her neighbors bestowed on me a variety of obsolete Argentine coins. Tom and I left Frias the next day, touched by everyone’s generosity.